Jelleez earbuds feature soft, gel earpieces that nestle securely yet comfortably in your ear for an enjoyable listening experience. Built-in microphone allows hands-free conversations so you can talk while you're on-the-go. 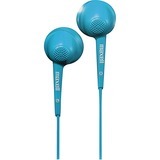 Compact size allows you to keep these earbuds virtually anywhere to ensure they're always within quick reach. Lightweight design provides a relaxed, enjoyable fit to stay comfortable in your ears through extended listening periods.